Members of the human family who've had the courage, faith and confidence to follow their heart and in doing so, have inspired others to do the same. Guglielmo Marconi, 1st Marquis of Marconi (25 1874 - 1937) was an Italian inventor and electrical engineer known for his pioneering work on long-distance radio transmission and for his development of Marconi's law and a radio telegraph system. He is often credited as the inventor of radio, and he shared the 1909 Nobel Prize in Physics with Karl Ferdinand Braun "in recognition of their contributions to the development of wireless telegraphy." Marconi was an entrepreneur, businessman, and founder of The Wireless Telegraph & Signal Company in the United Kingdom in 1897 (which became the Marconi Company). He succeeded in making a commercial success of radio by innovating and building on the work of previous experimenters and physicists. In 1929, the King of Italy ennobled Marconi as a Marchese (marquis). Marconi was born into the Italian nobility as Guglielmo Giovanni Maria Marconi in Bologna on 25 April 1874, the second son of Giuseppe Marconi (an Italian aristocratic landowner from Porretta Terme) and his Irish/Scots wife Annie Jameson (daughter of Andrew Jameson of Daphne Castle in County Wexford, Ireland and granddaughter of John Jameson, founder of whiskey distillers Jameson & Sons). Between the ages of two and six, Marconi and his elder brother Alfonso were brought up by his mother in the English town of Bedford. After returning to Italy, at age 18 University of Bologna physicist Augusto Righi, neighbour of Marconi who had done research on Heinrich Hertz's work, permitted Marconi to attend lectures at the university and use the lab and library as well. Marconi received further education in Florence at the Istituto Cavallero and, later, in Livorno. Marconi did not do well in school, according to Robert McHenry, though historian Giuliano Corradi characterizes him in his biography as a true genius. He was baptized as a Catholic but had been brought up as a member of the Anglican Church, being married into it (although this marriage was later annulled). Marconi was confirmed in the Catholic faith and became a devout member of the Church before his marriage to Maria Christina in 1927. During his early years, Marconi had an interest in science and electricity and in the early 1890s he began working on the idea of "wireless telegraphy" -i.e., the transmission of telegraph messages without connecting wires as used by the electric telegraph. This was not a new idea; numerous investigators and inventors had been exploring wireless telegraph technologies and even building systems using electric conduction, electromagnetic induction and optical (light) signalling for over 50 years, but none had proven technically and commercially successful. A relatively new development came from Heinrich Hertz, who demonstrated beginning in 1888 that one could produce and detect electromagnetic radiation now generally known as radio waves, at the time more commonly called "Hertzian waves" or "aetheric waves." There was a great deal of interest in radio waves in the physics community but the explorations were more along the lines of discerning the nature of the phenomenon. Physicists generally looked on radio as an invisible form of light, a short range phenomenon that could only be detected on line of sight making it unsuitable for communication. Hertz's death in 1894 brought published reviews of his earlier discoveries including a demonstration on the transmission and detection of radio waves by the British physicist Oliver Lodge and an article about Hertz's work by Marconi's teacher, Augusto Righi. Righi's article renewed interest in developing a wireless telegraphy system based radio waves on the part of Marconi, a line of inquiry that he noted other inventors did not seem to be pursuing. Marconi, just twenty years old, began to conduct experiments, building much of his own equipment in the attic of his home at the Villa Griffone in Pontecchio, Italy with the help of his butler Mignani. In the summer of 1894, he built a storm alarm made up of a battery, a coherer (an early detector that changed resistance when exposed to radio waves), and an electric bell, which went off if there was lightning. Soon after he was able to make a bell ring on the other side of the room by pushing a telegraphic button on a bench. One night in December 1894, Guglielmo woke his mother and invited her into his secret workshop and showed her the experiment that he had created. The next day, he also showed his work to his father, who gave his son all of the money he had in his wallet when he was certain that there were no wires, so that Guglielmo could buy more materials. In the summer of 1895, Marconi moved his experimentation outdoors and continued to experiment on his father's estate in Bologna. He tried different arrangements and shapes of antenna but even with improvements he was only able to transmit signals up to one-half mile, a distance Oliver Lodge had predicted in 1894 as the maximum transmission distance for radio waves. Marconi wrote to the Ministry of Post and Telegraphs, then under the direction of the honorable Pietro Lacava, explaining his wireless telegraph machine and asking for funding. He never received a response to his letter which was eventually dismissed by the Minister who wrote "to the Longara" on the document, referring to the insane asylum on Via della Lungara in Rome. In 1896, Marconi spoke with his family friend Carlo Gardini, Honorary Consul at the United States Consulate in Bologna, about leaving Italy to go to England. Gardini wrote a letter of introduction to the Ambassador of Italy in London, Annibale Ferrero, explaining who Marconi was and about these extraordinary discoveries. In his response, Ambassador Ferrero advised them not to reveal the results until after they had obtained the copyrights. He also encouraged him to come to England where he believed it would be easier to find the necessary funds to convert the findings from Marconi's experiment into a practical use. Finding little interest or appreciation for his work in Italy, Marconi travelled to London in early 1896 at the age of 21, accompanied by his mother, to seek support for his work. (He spoke fluent English in addition to Italian.) Marconi arrived at Dover and the Customs officer opened his case to find various contraptions and apparatus. The customs officer immediately contacted the Admiralty in London. While there, Marconi gained the interest and support of William Preece, the Chief Electrical Engineer of the British Post Office. 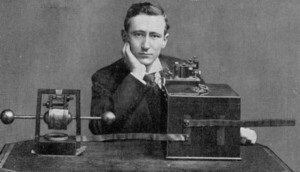 Marconi made his first demonstration of his system for the British government in July 1896. A further series of demonstrations for the British followed by March 1897, Marconi had transmitted Morse code signals over a distance of about 6 kilometres (3.7 mi) across Salisbury Plain. On 13 May 1897, Marconi sent the world's first ever wireless communication over open sea. The experiment, based in Wales, witnessed a message transversed over the Bristol Channel from Flat Holm Island to Lavernock Point in Penarth, a distance of 6 kilometres (3.7 mi). The message read "Are you ready?" The transmitting equipment was almost immediately relocated to Brean Down Fort on the Somerset coast, stretching the range to 16 kilometres (9.9 mi). Impressed by these and other demonstrations, Preece introduced Marconi's ongoing work to the general public at two important London lectures: Telegraphy without Wires, at the Toynbee Hall on 11 December 1896; and Signaling through Space without Wires, given to the Royal Institution on 4 June 1897. Numerous additional demonstrations followed, and Marconi began to receive international attention. In July 1897, he carried out a series of tests at La Spezia, in his home country, for the Italian government. A test for Lloyds between Ballycastle and Rathlin Island, Ireland, was conducted on 6 July 1898. The English channel was crossed on 27 March 1899, from Wimereux, France to South Foreland Lighthouse, England, and in the autumn of 1899, the first demonstrations in the United States took place, with the reporting of the America's Cup international yacht races at New York. Marconi sailed to the United States at the invitation of the New York Herald newspaper to cover the America's Cup races off Sandy Hook, NJ. The transmission was done aboard the SS Ponce, a passenger ship of the Porto Rico Line. 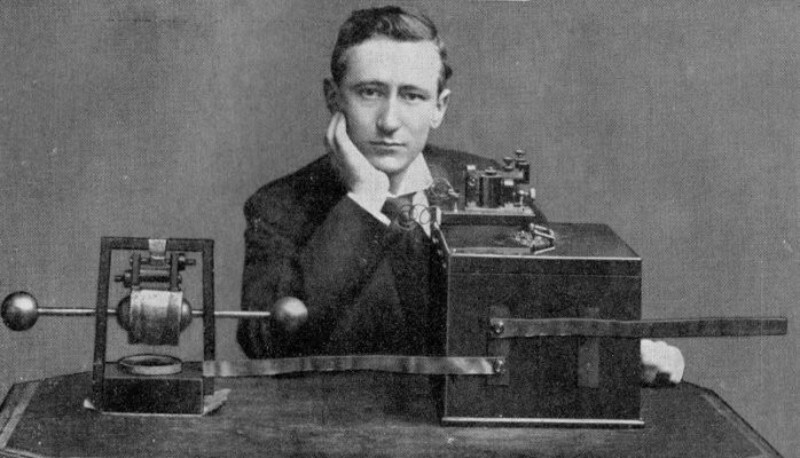 Marconi left for England on 8 November 1899 on the American Line's SS Saint Paul, and he and his assistants installed wireless equipment aboard during the voyage. On 15 November Saint Paul became the first ocean liner to report her imminent return to Great Britain by wireless when Marconi's Royal Needles Hotel radio station contacted her sixty-six nautical miles off the English coast. At the turn of the 20th century, Marconi began investigating the means to signal completely across the Atlantic in order to compete with the transatlantic telegraph cables. Marconi established a wireless transmitting station at Marconi House, Rosslare Strand, Co. Wexford in 1901 to act as a link between Poldhu in Cornwall, England and Clifden in Co. Galway, Ireland. He soon made the announcement that the message was received at Signal Hill in St John's, Newfoundland (now part of Canada) on 12 December 1901, using a 500-foot (150 m) kite-supported antenna for reception signals transmitted by the company's new high-power station at Poldhu, Cornwall. The distance between the two points was about 2,200 miles (3,500 km). It was heralded as a great scientific advance, yet there also was and continues to be considerable skepticism about this claim. The exact wavelength used is not known, but it is fairly reliably determined to have been in the neighborhood of 350 meters. The tests took place at a time of day during which the entire transatlantic path was in daylight. We now know (although Marconi did not know then) that this was the worst possible choice. At this medium wavelength, long distance transmission in the daytime is not possible because of heavy absorption of the skywave in the ionosphere. It was not a blind test; Marconi knew in advance to listen for a repetitive signal of three clicks, signifying the Morse code letter S. The clicks were reported to have been heard faintly and sporadically. There was no independent confirmation of the reported reception, and the transmissions were difficult to distinguish from atmospheric noise. (A detailed technical review of Marconi's early transatlantic work appears in John S. Belrose's work of 1995.) The Poldhu transmitter was a two-stage circuit. Feeling challenged by skeptics, Marconi prepared a better organized and documented test. In February 1902, the SS Philadelphia sailed west from Great Britain with Marconi aboard, carefully recording signals sent daily from the Poldhu station. The test results produced coherer-tape reception up to 1,550 miles (2,490 km), and audio reception up to 2,100 miles (3,400 km). The maximum distances were achieved at night, and these tests were the first to show that radio signals for mediumwave and longwave transmissions travel much farther at night than in the day. During the daytime, signals had only been received up to about 700 miles (1,100 km), less than half of the distance claimed earlier at Newfoundland, where the transmissions had also taken place during the day. Because of this, Marconi had not fully confirmed the Newfoundland claims, although he did prove that radio signals could be sent for hundreds of kilometres, despite some scientists' belief that they were essentially limited to line-of-sight distances. Marconi began to build high-powered stations on both sides of the Atlantic to communicate with ships at sea, in competition with other inventors. In 1904, a commercial service was established to transmit nightly news summaries to subscribing ships, which could incorporate them into their on-board newspapers. A regular transatlantic radio-telegraph service was finally begun on 17 October 1907 between Clifden Ireland and Glace Bay, but even after this the company struggled for many years to provide reliable communication to others. On 18 June 1912, Marconi gave evidence to the Court of Inquiry into the loss of Titanic regarding the marine telegraphy's functions and the procedures for emergencies at sea. Britain's postmaster-general summed up, referring to the Titanic disaster: "Those who have been saved, have been saved through one man, Mr. Marconi...and his marvelous invention." Marconi was offered free passage on Titanic before she sank, but had taken Lusitania three days earlier. As his daughter Degna later explained, he had paperwork to do and preferred the public stenographer aboard that vessel. Over the years, the Marconi companies gained a reputation for being technically conservative, in particular by continuing to use inefficient spark-transmitter technology which could only be used for radiotelegraph operations, long after it was apparent that the future of radio communication lay with continuous-wave transmissions which were more efficient and could be used for audio transmissions. Somewhat belatedly, the company did begin significant work with continuous-wave equipment beginning in 1915, after the introduction of the oscillating vacuum tube (valve). The New Street Works factory in Chelmsford was the location for the first entertainment radio broadcasts in the United Kingdom in 1920, employing a vacuum tube transmitter and featuring Dame Nellie Melba. In 1922, regular entertainment broadcasts commenced from the Marconi Research Centre at Great Baddow, forming the prelude to the BBC, and he spoke of the close association of aviation and wireless telephony in that same year at a private gathering with Florence Tyzack Parbury, and even spoke of interplanetary wireless communication. Marconi died in Rome on 20 July 1937 at age 63, following a series of heart attacks, and Italy held a state funeral for him. As a tribute, shops on the street where he lived were "Closed for national mourning." In addition, at 6 pm the next day, the time designated for the funeral, all BBC transmitters and wireless Post Office transmitters in the British Isles observed two minutes of silence in his honor. The British Post Office also sent a message requesting that all broadcasting ships honor Marconi with two minutes of broadcasting silence as well. His remains are housed in the Villa Griffone at Sasso Marconi, Emilia-Romagna, which assumed that name in his honour in 1938. On 16 March 1905, Marconi married the Hon. Beatrice O'Brien (1882 - 1976), a daughter of Edward O'Brien, 14th Baron Inchiquin, having met her in Poole in 1904. They had three daughters, Degna (1908 - 1998), Gioia (1916 - 1996), and Lucia (born and died 1906), and a son, Giulio, 2nd Marchese Marconi (1910 - 1971). On 12 June 1927 (religious 15 June), Marconi married Maria Cristina Bezzi-Scali (1900 - 1994), only daughter of Francesco, Count Bezzi-Scali. They had one daughter, Maria Elettra Elena Anna (born 1930), who married Prince Carlo Giovannelli (born 1942) in 1966; they later divorced. For unexplained reasons, Marconi left his entire fortune to his second wife and their only child, and nothing to the children of his first marriage. Marconi wanted to personally introduce in 1931 the first radio broadcast of a Pope, Pius XI, and did announce at the microphone: "With the help of God, who places so many mysterious forces of nature at man's disposal, I have been able to prepare this instrument which will give to the faithful of the entire world the joy of listening to the voice of the Holy Father."